When you come to Lake Hallie Cabinets & Design, you truly get both – cabinets AND interior design. We take the details into consideration and will not only help you in finding cabinets, but help you design an entirely new space for your home. We can build the cabinets to suit your current space or work with a builder to build them into your new construction home. You'll even be able to see what your new space will look like ahead of time using our 3D interactive showroom computer software. You've come to us for cabinets – now, what about the rest of the room? The last thing we want you to do is wonder what color or pattern goes with that style, or what type of pictures to hang on the walls. 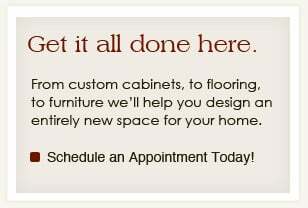 Lake Hallie Cabinets' experienced Eau Claire area interior designers will help you decorate by choosing furniture, countertops, flooring, paint colors, and accessories to complete the look you want. Our staff will come to your home and learn about what you like and don't like, and help you decorate your home, completing the look and feel. Cabinets & Design. All rights reserved.